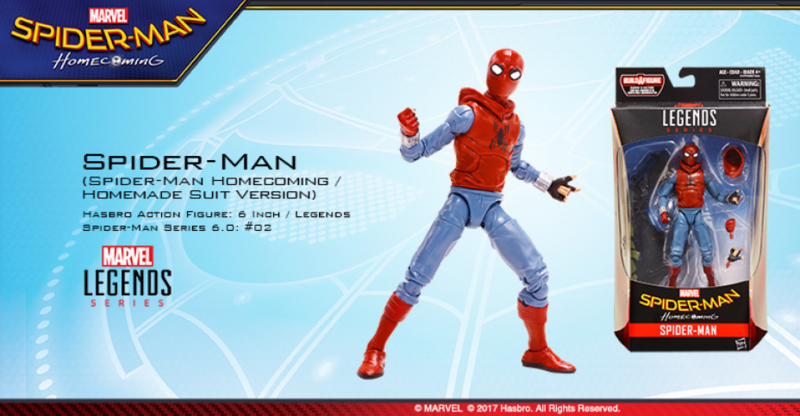 Thanks to MFCT Marvel、DC、星際大戰 情報&客製化 for posting up images for Spider-Man Homecoming in package Marvel Legends. Check out all the new Spider-Man: Homecoming images after the jump. This wave is looking great, I like how the backgrounds of the inserts for the movie figures are kinda sky blue. im ready to preorder this set !!! 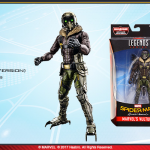 This will be the first Spidey wave since the Hobgoblin one I don't bother getting everyone. The lack of accessories is quite disturbing. You don't get it...the Wings are the accessories....???? I don't get it either. Such a shame. It screams Keaton head...but this is Hasbro after all. ...??? 4/7 figures in the wave have a fair amount of accessories. Not as good as the last couple of waves, but it's not like there's only one figure in the wave with any accessories or anything. I do wish were getting a Michael Keaton unhelmeted head though, but they might not have gotten the likeness rights for him. I don't know. The wings for Vulture are the BAF, because the wings are absolutely massive. This wave has surprised me in almost every way. First being an Air Force guy I love the Vulture, the Jacket, design, all of it. I was all ready for the wave thinking I was all in. I also couldn't wait for Tombstone. 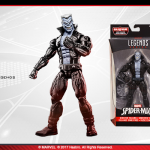 I hated the Spideys and thought beetle sucked because we just had a Figure like this that is still filling all the peg slots where my Warlock wave SHOULD be. I also could wait for a Moon Knight. Fast forward to present and these photos. Vulture is still cool but needs those wings to look complete. Looking at the wave I feel no desire to get the other figures for the simple wing parts. Tombstone is kinda plain with his outfit painted on. 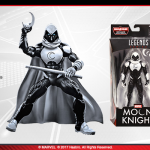 Moon Knight's outfit is underwhelming I guess because it is based on the new version? I think his accessories look ok though. What will we do with tiny moons? 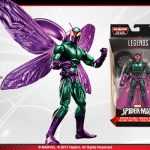 And speaking of wings I think the one figure that looks pretty good is the beetle. I think he turned out better than I had anticipated. Sculpting looks really good but he will still probably fill pegs next to the last green and purple legends character. I completely forgot about the cosmic spider man which should say what I think about that figure. You guys know the one, the spiderman that was just the captain america, that was just...well you get it. Put a spider Web over his mouth and call him something else. I don't care for it, where is the effort? I am glad he is getting an alternate head so it can be used on another figure like Sunfire or another figure. Unless they pulled an old man logan and changed the ball size. Tombstone is kinda plain with his outfit painted on. The small crescent darts fit in between the fingers of his fist. While the figure of Moon Knight isn't my ideal look, Mr. Knight or classic white would have been preferred, I'm looking forward to it anyway and I like how they used his current logo for his name spot. Most of this looks fantastic! 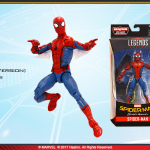 I'm holding out hope the wings on the Spidey are removable.... but if hasbro trends are anything to go by, with black bolt specifically, I think they'll just be awkwardly dangling, begging to be held in certain poses. 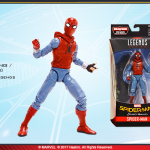 I hope with the release of the two pack with iron man, the hands and heads between that Spidey and the BAF Spidey all can be swapped with each other. That way I can get my unwinged and winged Spider-Men. Just need those pre-orders to go up! Not one...but three villians in a wave? I'll take it! Although I will admit. I'm already having visions of yet another Beetle figure clogging up pegs when this hits. Really digging "the Human Spider..."
I can't wait for Homemmade Suit Spidey!!! The lack of accessories is quite disturbing. Moon Knight is a Must , might get Tombstone, i dunno. While as i said, im ready forva preorder. Im honestly not too fond of the movie figures. 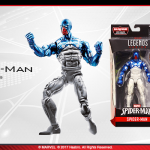 I'll be getting this wave mainly for moon knight, cosmic spidey, tombstone, and beetle. I actually think the Vulture is really cool. I just don't see a point in having him though when a comic Vulture is on the way. The only movie versions I have in my collection are the ones who I don't hvae comic versions too, except for Spider-Man himself, as the Garfield Spidey is on my Spider-Verse shelf. Tombstone and Beetle don't have any accessories and Spidey is missing open hands. He only comes with thwip and fists. I think the movie Vulture looks fine, but it is completely nonsensical. If your winged backpack had to be that enormous, why wouldn't you just use a small plane? I guess that sounds really silly when I'm criticizing the logic of a movie about a teenager with spider themed superpowers though. The movie looks great but the Vulture figure doesn't do anything for me. Probably only picking up Tombstone and the web wings Spidey from this wave. Because you couldn't beat up Spiderman from a plane, lack of maneuverability in a plane, etc. I'm sure the wings will work fine in the movie itself. Or since this is the MCU, maybe there's a twist where it's not Michael Keaton's character under the mask and Hasbro didn't want to give the twist away? I don't know, it's just strange since there's no shortage of Michael Keaton heads on Batman figures in the world. Possible but unlikely since we've seen images of Michael Keaton in the movie wearing pretty much the entire suit minus the helmet, wings, and talons. Just the Beetle, Tombstone for me. Still on the fence about that modern MK with white flipflops. WTF is up with that?